In conjunction with Future Forest Research, Interpine has been developing a Harvest Navigation System called HarvestNav. 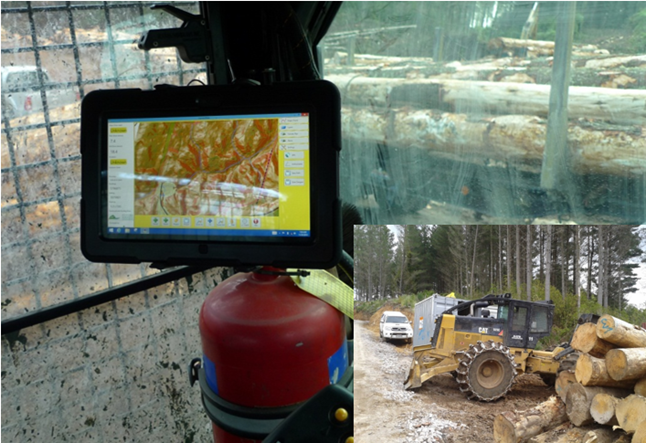 Interpine recently presented the HarvestNav system at the Foresttech Conference in Nov 2013. This outlined a series of recent in forest trials of the system. The results were extremely positive with machine operators being very comfortable with the technology and with it improving the communication of the harvest planning information directly to the operator making in field decisions. 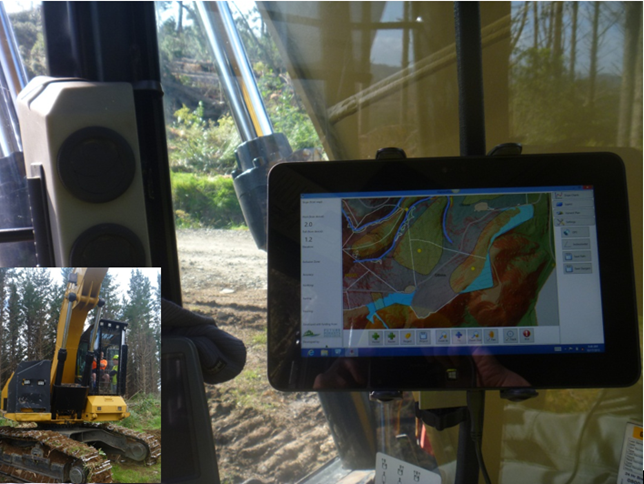 The in forest use of consumer grade GNSS GPS receivers present in the tablet deployed was surprising sufficient in all use cases during the trials. This proved there was no need for an external GPS antenna and further reduces the implementation and maintenance costs. The focus of the system is safety and the development was focused on a way to warn machine operators about surrounding terrain, and the realisation that mechanisation will not stop all logging accidents. As we are pushing equipment onto steeper and steeper country we must manage the potential risk of machine rollovers. 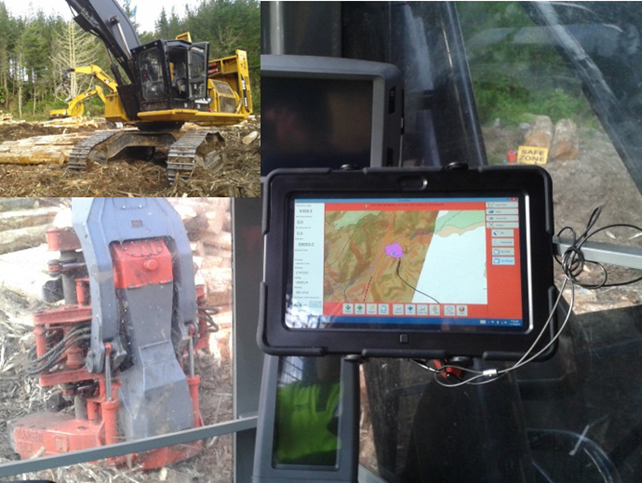 Figure 1,2 and 3 show the system being trialled running on a Dell Windows 8 consumer grade Tablet in a ruggedized case. 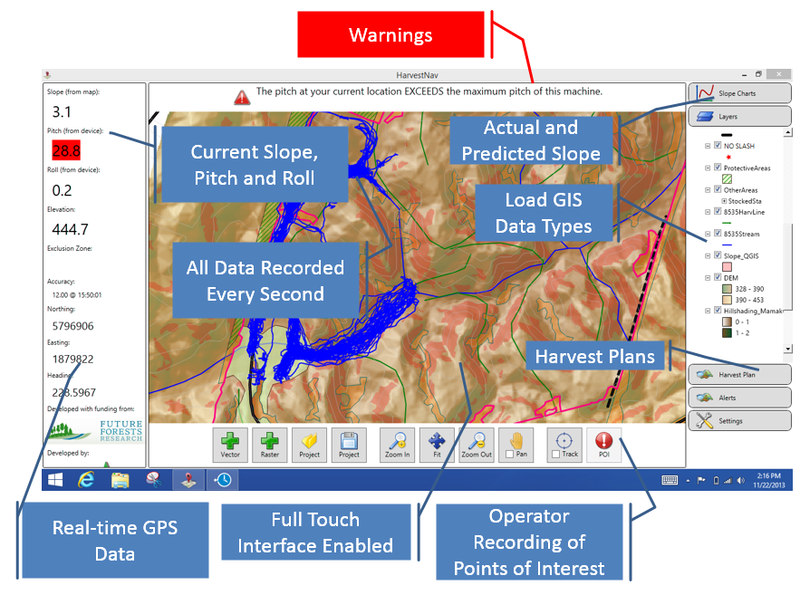 Figure 4 – Key Onscreen Features of the HarvestNav system. As well as providing and warning the operator of actual machine tilt and roll, and these potential parameters forward of the machine on its intended path, it records this and the history of the machines movements with the GPS, providing in a way an audit trial of operator behaviour much like systems such as Smartrak do for on highway vehicles, or the black box in a plane. The warnings are displayed with the entire application background changing differen shades of colour (red, yellow) to alert a user to a warning message on the display as seen in Figure 2 and 3. One of the key feedback items from the operator’s was the warnings linked to the harvest plans loaded. This provides warnings of tracks, steams and protected areas, along with harvest area boundaries. This quickly moves the harvest plan from a document to a live visual feed to the operator. Do you wish to trial the system? The demonstration system is available for trial, and if you have any questions feel free to contact us.